Beaches Negril is a family-friendly, all-inclusive resort that’s sure to be fun for the whole family. With its beautiful beaches, large pools, restaurants, and nice hotel rooms, Beaches Negril has got to be on every family’s radar. I know my family had an incredible time at this resort, as well as the Beaches resort in Turks and Caicos. Every second of sunshine was worth the plane ride across and out of the country. 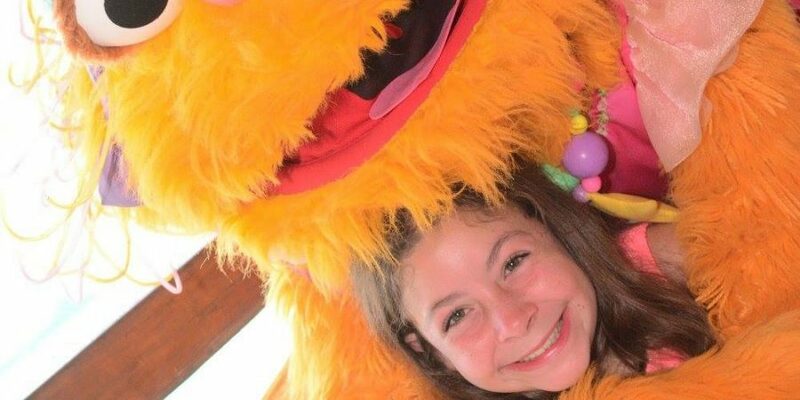 When we arrived at the resort for the first time, there were all sorts of characters from Sesame Street to greet us. This is because Beaches is one of their proud sponsors. The other, younger, children were very excited to see them. I’m not sure if this is something that happens at the main entrance of Beaches Negril every day, or just sometimes for certain guests. Music was playing, and there were dancers that waved us on toward the pools and hotel rooms. It was one of the grandest entrances I’ve ever experienced, and it excited me for the vacation to come. 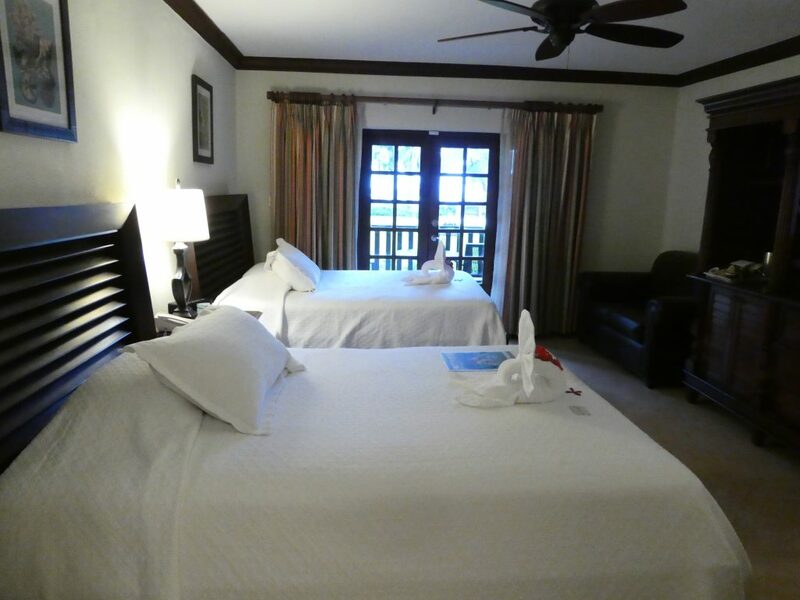 There are over a dozen different types of hotel rooms and suites at Beaches Negril. Surely, you can find the proper room to accommodate everyone in your party. My family stayed in one of the smaller hotel rooms. There were only three of us on that trip, after all. the bed was quite large, and we even had a patio. The room was of decent size, although this didn’t really matter because we were hardly in the room at all. Most of our time was spent in bathing suits at the pool or beach. Throughout the entirety of our stay, there was a stray cat that would lounge around on our patio and climb on the patio railing. It didn’t bother us, although it scared me pretty good one time. I was not expecting the cat to pop up by the railing out of nowhere. 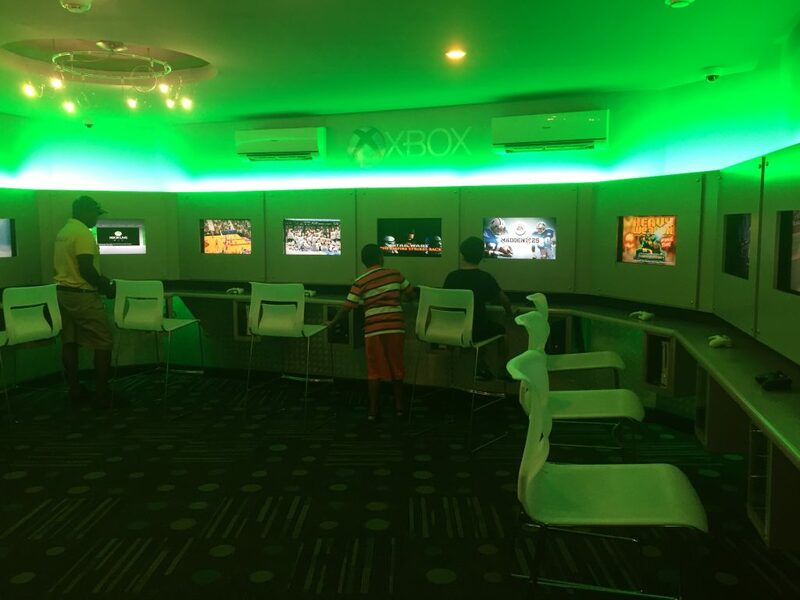 While roaming around the resort, my family came across the Xbox Play Lounge. We walked inside, where the walls were lined with screens. They kept it very cold inside the lounge, probably to keep the consoles from overheating. I don’t ever play video games, so the only time I went in there was to get my brother. This all-inclusive resort also has a kids camp. There are different programs for all ages, filled with lots of fun and activities. Jonah and I didn’t really want to join any of the programs. 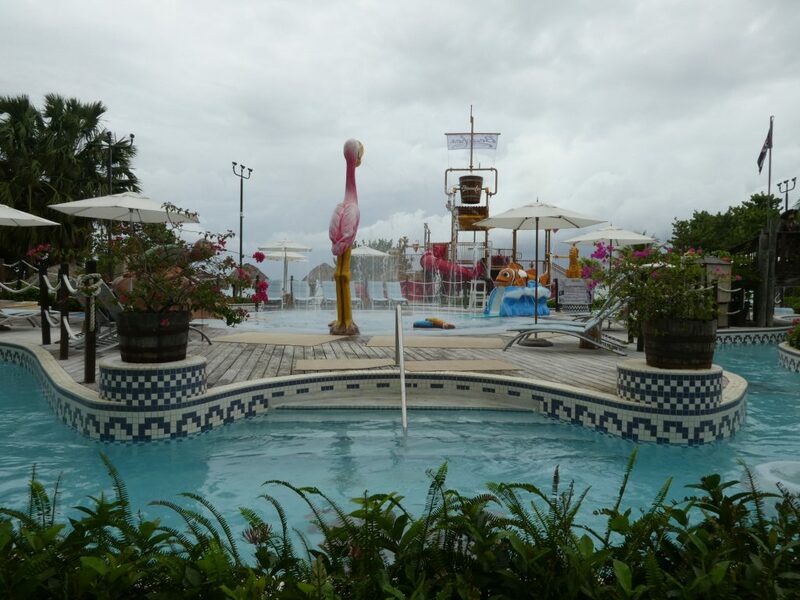 We would rather roam the resort independently, although the kids club did sound enticing. Beaches Negril has a fantastic water park and large swimming pools. It’s an 18,000 square foot area with plenty of fun things to do. My brother and I spent almost our entire vacation at Pirates Island. The staff at the water park, and around the resort, was very friendly. It was very stormy for part of the trip. The water park at Beaches Negril goes by the name of Pirates Island. With two different water slides, my brother, Jonah, made a couple of friends and had a blast. I can’t even count the number of times that Jonah raced down those water slides. Unfortunately, I only ever went down the slides once. The employees wouldn’t let people wear goggles on the slides, so that was a no for me. When you have extremely sensitive eyes, you simply can’t enjoy a water slide without goggles. The lazy river was also very relaxing, and I spent quite a lot of time in here. Of course, my brother and his new friend would come over and disturb the peace every once in a while. They would speed through the course of the lazy river, sneak up behind me, and attempt to flip over my inner tube. Most of their attempts were failures, although they did get me a couple of times. Obviously, it was all in good fun, and Jonah eventually let me go back to my relaxation. The pirate-themed water park also has a hot tub, or whirlpool, that my mother and I thoroughly enjoyed. A dip in the hot tub is just what we needed after a long day of running around in the sun. In this photo, you can see the swan floaty that got its head popped. Beaches Negril has two large swimming pools filled with cold, clear water. 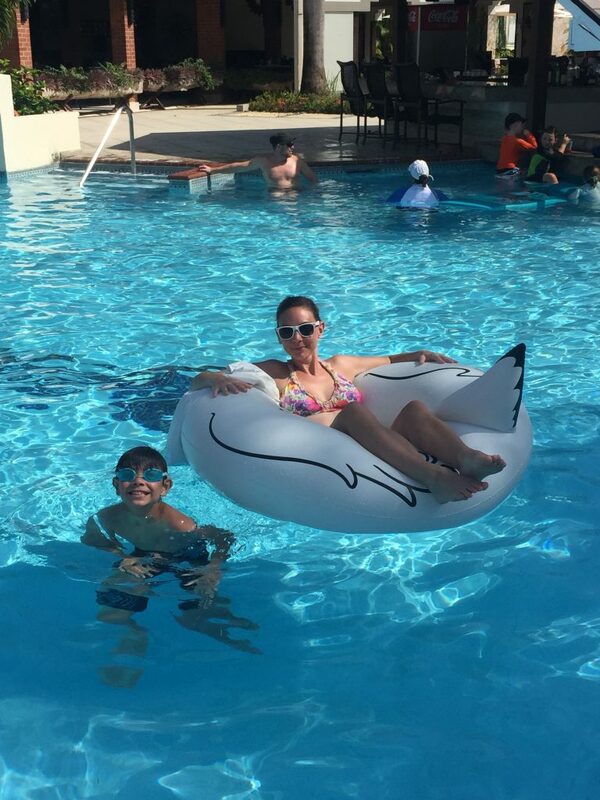 One of them had a swan floaty, although we found out it had been popped on the last day of our trip. Within one of the pools is a swim-up bar that serves up a whole assortment of drinks, including tropical smoothies. There’s also an ice-cream machine near the pool. I had at least two ice-cream cones a day, and I have no idea how many Jonah ate. Every time I saw him, he was finishing off another cone. It was tempting not to grab a cone every time I walked past the ice-cream machine, so I can’t really blame him. My family and I also played mini golf, located near one of the main pools. Pirates Island also has a kiddie area with a splash pad and small slides. I’d lie and tell you that we never spent any time here, but that’s simply not true. On our first night of the trip, my family and I were sitting in the hot tub nearest the kiddie area. Due to it being dark out, the splash pad was turned off. No matter, we joined some random kid in finding a way down the teensy kid slides that we barely fit through. I don’t know why we found this so fun, but we chased each other around for quite a while, even though we were too large for the slides and it kind of hurt. 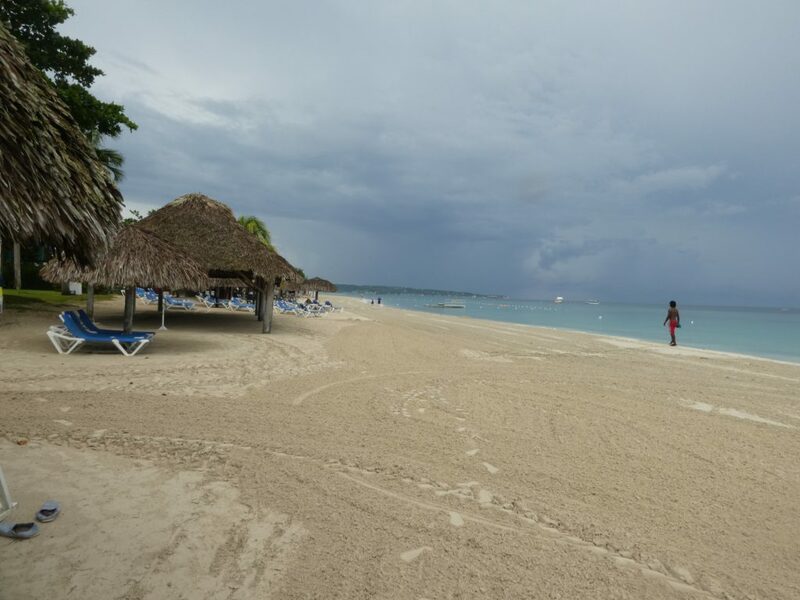 The sand at Beaches Negril was lovely and white. The water was a beautiful blue, and it wasn’t too cold either. There were plenty of beach chairs, as well as cabanas. It was the perfect place to sunbathe and tan. You can sign up for all sorts of activities on and off the beach. It’s often sunny and peaceful, up until the parties, of course. There are a number of different activities that you can sign up for at a stand right on the beach. There’s snuba diving, glass bottom boat tours, and all sorts of other water sports. 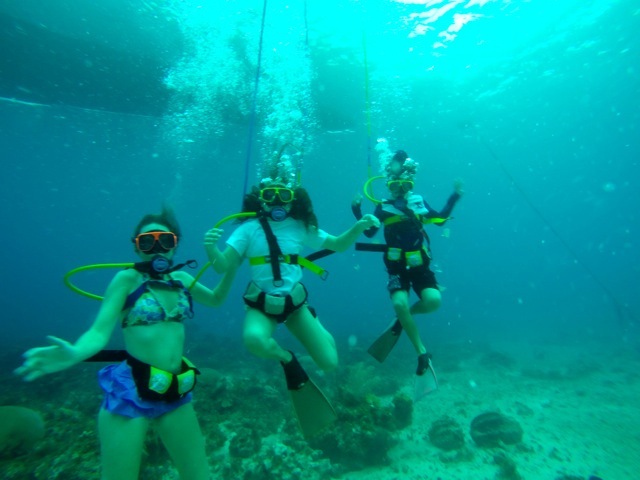 My family and I only ever did snuba diving and the glass bottom boat tour. The glass bottom boat tour was pretty uneventful. This area of Jamaica doesn’t exactly have much of a coral reef or many fish. I would not recommend taking the glass bottom boat tour because there’s really nothing to see. Something that I would recommend is snuba diving. Although I was a bit nervous about it at first, once we were beneath the water, everything was fine. Scuba diving is when you carry the air tank on your back. Snuba diving is when the air tank is on the boat, and a tube from the tank goes down to you beneath the water. Before this trip, I had never done anything like this before. Although there was not much to see beneath the water, it was still a very cool experience. Of course, there are several other activities that you can sign up for, but my family just wanted to bum around the resort. Beaches Negril has an assortment of different places to eat. It’s a very large resort, with a number of different restaurants and shops located throughout. Although I list a few different places, keep in mind there are other restaurants that we didn’t try out, including Italian food and frozen yogurt. Every morning at Beaches Negril, my family and I would exit the hotel room, excited for the new day. Then we would walk over to the breakfast buffet. The buffet consisted of traditional breakfast food; eggs, bacon, sausage, hash browns, fruit, and toast. Like any other buffet, there were also some options that were kind of out there, but people ate them, even if it wasn’t meant to be breakfast food. Although this cafe is quite far from the room we stayed in, my brother and I still made the journey across the resort. The cafe served up different desserts every time we entered, and each of them was splendid. They also have hot chocolate, coffee, crepes, and other sweet treats. One of the desserts that I got from the cafe was a small chocolate cake with delicious frosting and layers. It was tempting to grab another one, but I refrained. 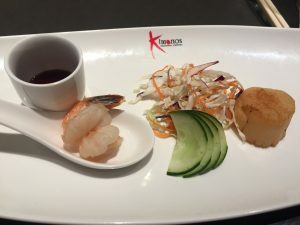 Kimonos is a restaurant that serves oriental cuisine. It’s one of those restaurants where your party sits at a table around the large grill, and the chef comes out and cooks up all the food right in front of you. Of course, this included an onion volcano and a series of people having to catch food in their mouths. It was a fairly nice restaurant, just make sure to book a reservation. Soy is a small sushi place at Beaches Negril all-inclusive resort. The restaurant is tucked away in a more private part of the resort. Unfortunately, we never got around to eating here, although I hear they have incredibly flavorful sushi. My family and I ate at Mariachi, the Mexican food restaurant at Beaches, once. Located next to the pool, there was a short wait. We were eventually seated, and I ordered the soft tacos. 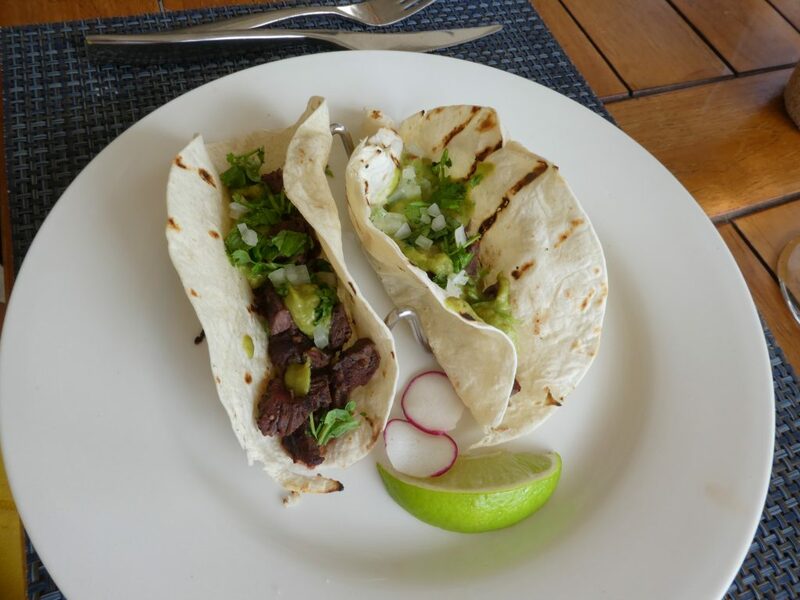 They were quite good, average tacos. There wasn’t any chips and salsa, but that’s okay. My brother and I were wanting to get back to the pool anyway. Bar.B.Q is also located right next to the pool. My brother and I got food here a couple of times for a quick lunch or snack. They serve burgers, BBQ chicken, ribs, brisket, and pulled pork sandwiches. A number of times, I stopped here just to order some fries. Beaches Negril hosts a couple of different parties for its guests. One night of the trip, there was a party on the beach. There was a buffet filled with Jamaican food and a show on the stage. The characters from Sesame Street came out and partied with us, as we ate and danced. It was a very fun beach party. During the show, there was a man who performed a dangerous balancing act. Normally you only see that kind of stuff on tv, so it’s not that scary, but watching it in real time puts you on edge. Luckily, he did great, despite falling a couple times. Another night, guests at the resort stood by and watched a sort of parade with dancers and people who breathed fire. At one point, the guests were invited to join in the little parade around the resort. Once more, the Sesame Street characters appeared. How could I ever forget the chocolate party? There were several tables, lined with plates, filled with dozens upon dozens of delicious chocolates. They had every kind; white, milk, and dark. My favorite kind of chocolate is dark, although both of my brothers think that dark chocolate tastes disgusting. They prefer white chocolate, which is my least favorite. I don’t even understand why it’s classified as chocolate. 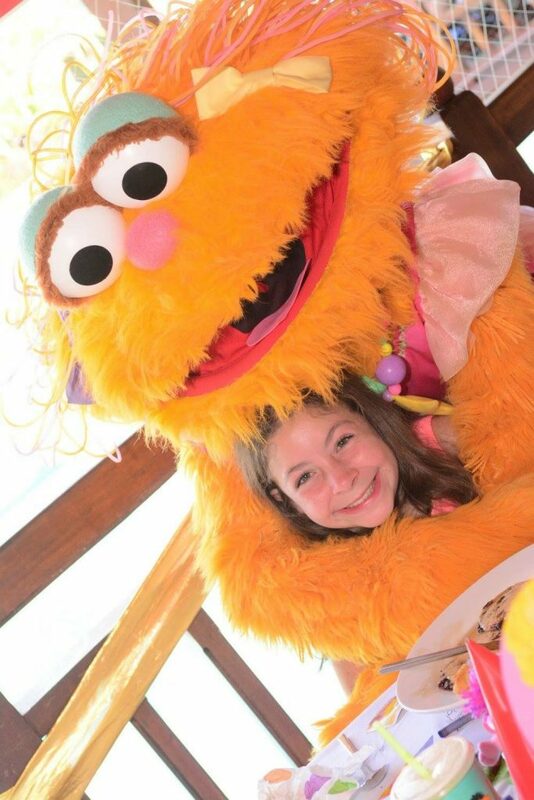 Beaches Negril also has a special breakfast where kids can meet the characters from Sesame Street. Although Jonah and I were multiple years older than most of the kids at the breakfast, we still had a good time. The buffet at the breakfast was the same as the normal breakfast buffet, just slightly smaller. During the breakfast, somebody came by and gave out finger puppets of the characters. When the characters came out to meet everyone, the kids got very excited. The characters took lots of pictures with people, making for a pleasant end to the breakfast. Beaches Negril is a paradise. It’s sunny, beautiful, fun, and family-friendly. I couldn’t ask for any more from an all-inclusive resort. The staff was friendly, and the resort catered to our every desire. I’d recommend this resort to everyone, even those without kids. Beaches Negril is a fantastic resort that people should seriously consider for their next vacation.